I look forward to posting the new mash ups and videos from Robin Skouteris in 2011. I sent him a message recently on youtube to say how much I enjoy his work and he sent back a lovely reply. Robin's latest mash up features the new Michael Jackson and Akon song Hold My Hand and ten other artists including Kelly Clarkson, Beyonce, Muse and Jason Derulo. It is a really flawless mix, as if all the artists had been in the studio together. When I heard the Backstreet Boys and Kelly Clarkson on the mix I knew I would dedicate this one to my sister Emma. Here's the very joyful L.O.V.E. as created and produced by my favourite remixer Robin Skouteris. This one is for David in Brighton. I swear to God that David works on blogging telepathy. 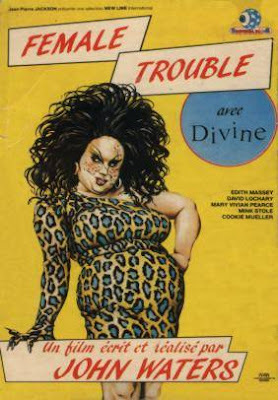 Around two weeks ago I was going to post a clip of Divine as Dawn Davenport in the John Waters film Female Trouble and didn't get round to it and then David refers to the same clip in a post on his blog last week. I first watched Female Trouble while on holidays in Baltimore. Myself and my fab friend Rosie stayed in her friend Jane's appartment and we watched the movie late one night on a video tape version. I loved every minute of it and it was even more wonderful to have seen it in the city it was filmed in. Forget The Wire, Baltimore is and always will be John Waters. I love David's attitude to Christmas. He hates it. For you David, here's Dawn on Christmas morning not getting those cha cha heels.